Green Springs & Hoke Animal Clinic offers our patient form(s) online so you can complete it in the convenience of your own home or office. Located in Homewood and Birmingham the veterinarians at Green Springs Animal Clinic and Hoke Animal Clinic are committed to your pet's health. Homewood based Green Springs Animal Clinic excels in the science of Veterinary medicine and was founded in 1965 by Dr. Ross Cryar. In 1985 a partnership was later formed with Hoke Animal Clinic in Birmingham near Irondale. Since then Dr. Brian Davies and Dr. Gregg Tucker along with associates and staff have excelled in compassionate veterinary care in the Homewood and Birmingham areas. 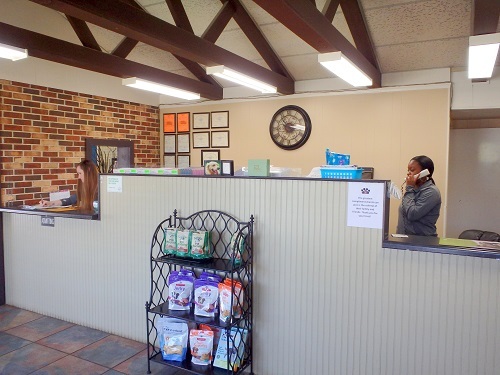 Green Springs Animal Clinic and Hoke Animal Clinic are full-service animal hospitals whose mission is to provide the highest standard of veterinary care for pets. We provide friendly, informative, and supportive services for you and your pet, while maintaining a superior working environment for our employees. Our hospitals offer medical, surgical, and dental veterinary care to the animal communities of Homewood, Birmingham, Vestavia, Mountain Brook and Irondale. Referral to 24- hour emergency care is provided. With an in-house pharmacy, access to specialists, grooming, and boarding (with Sunday pickup) our facility offers a one stop for your pet's health and medical care. We are open for appointments and emergencies during normal business hours 7 days a week. Free exams given to newly adopted pets from the local humane shelter! Ofrecemos servicios en Español en Green Springs Animal Clinic. Dr. Brian Davies is a 1985 graduate of Auburn University College of Veterinary Medicine. His career began with two years service as an associate veterinarian in Columbus, GA. at Animal General Hospital followed by two years at Patton Chapel Animal Clinic in Hoover. He has been with the Green Springs Animal Clinic and Hoke Animal Clinic since 1989. Dr. Davies and his wife Nancy have one daughter, four cats and two snakes. Dr. Gregg Tucker is a 1995 graduate of Auburn University College of Veterinary Medicine. He started as an associate at Green Springs Animal Clinic and Hoke Animal Clinic in 1995 and became an owner in 2000. Dr. Tucker and his wife Emily have two daughters , one dog, and one cat. Dr. Pete Giambrone is a 2015 graduated of Auburn University's College of Veterinary Medicine. He grew up in the Greater Birmingham area and attended the University of Alabama for his undergraduate studies where he earned a bachelor's degree in Biology. Dr. Giambrone has worked as an associate veterinarian at Hope Animal Clinic and Clay Chalkville Animal Clinic before joining the team at Green Springs Animal Clinic in December 2017. The Doctors Giambrone have five dogs, three cats, a parakeet, a bearded dragon, a ball python, and a betta fish. Dr. Alex Giambrone is a 2017 graduate of Auburn University College of Veterinary Medicine. She grew up in Birmingham, AL attending Briarwood Christian School. She received her bachelor's degree in Middle Eastern Archaeology from Princeton University , and worked on an excavation in Syria. Dr. Giambrone's husband, Dr. Pete Giambrone, is also a veterinarian. Together they have five dogs, three cats, a parakeet, a betta fish, and a ball python. "We live in trussville but were on our way back from the beach when our dog Casca started to have a full blown anxiety attack. We had never been to this vet - but they were absolutely great to us and Casca. They didn’t act frustrated by how we got there maybe an hour before close. Very informative. We are making them our primary vet now. Thank you!" "Our dog Lena loves going to this vet. When I tell her it's time to go to the vet, she gets very excited. The doctors and staff are great with her. She recently tore her ACL and they offered a couple of different financial options and places to take her, and ended up doing the surgery there and she's doing great 6 weeks later. Thank you!" ""Actually went there for Dr.G. since he was such a wonderful vet for my fur babies over the past year. I will continue to drive the distance knowing I have such a good, compassionate veterinarian with a heart of gold I can truly trust. Office staff was very pleasant, the place was clean, all good. Highly recommend.""